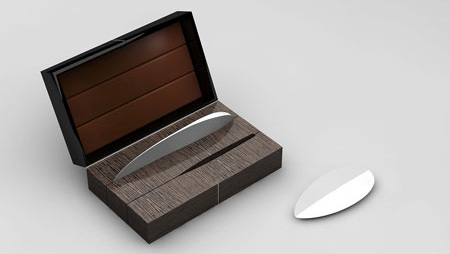 The most unusual modern knives and creative knife designs that will spice up anyone’s knife collection. 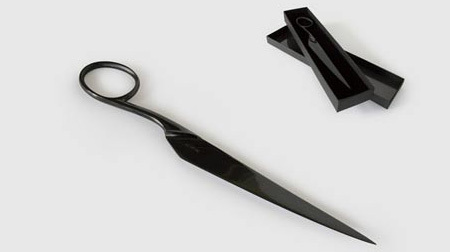 Inspired by scissors, this cool knife is made from black plated steel. 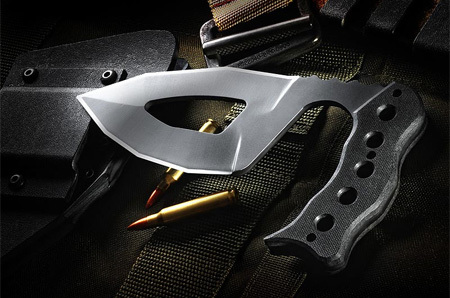 With multi-faceted edge design this knife gives the user more cutting angles than standard configured knives. Unusual knives inspired by the shape of Stone Age tools for a more basic approach to chopping, cutting, scraping, mincing and scooping. 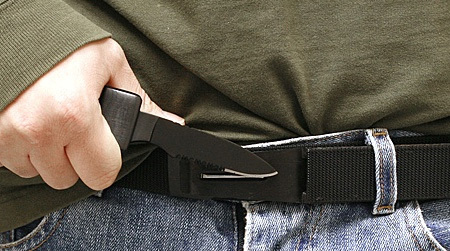 Tactical belt knife system features stainless steel combo blade knife to give you the upper hand in self defense situations. These handy knives are functional ink pens. 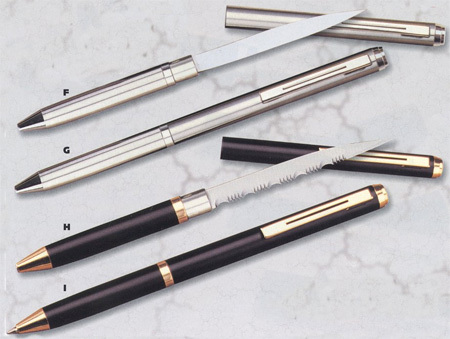 Just twist the handle to extend the pen point, or pull apart to reveal the blade. 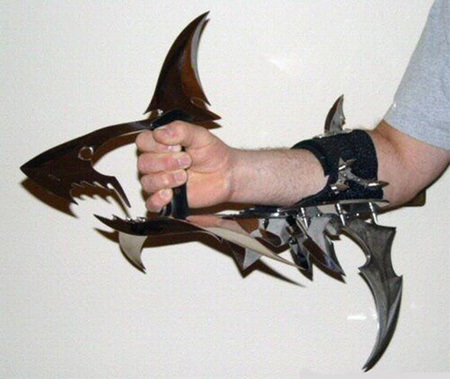 Extremely dangerous looking shark inspired edged weapon. Take off the cap and twist to expose a 1 1/4″ serrated knife blade. Bloody kitchen knife is gift-boxed with the official evidence tag. 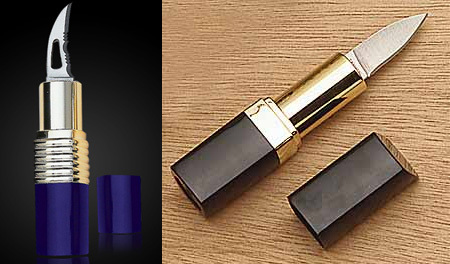 Made from a single piece of CPM S110V for extreme corrosion resistance and toughness in waterborne environments. 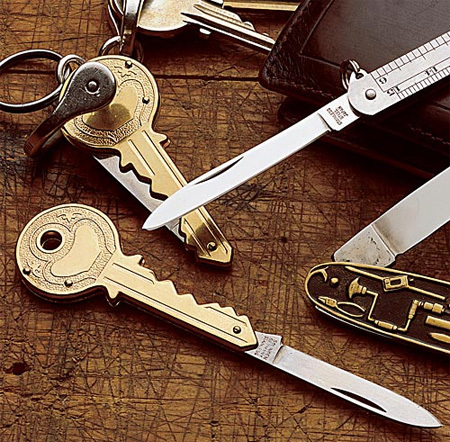 Barely larger than an ordinary key, this creative pocket knife will look great on your keychain. That’s awesome! Even practical, some of those. the shark one looks scary, but how would you use it? 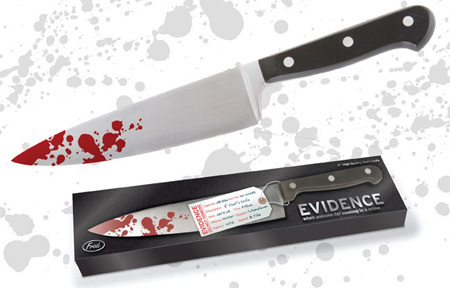 shark knife and the evidence knife are so cool!!! Man I love diver knives. The combination of form and function… that’s some real technology there. I think I’d be just as scared using the shark knife as I would be facing it. That thing looks like an accident waiting to happen. Totally irresponsible – nobody should be carrying or contemplating using a knife for “self-defence”. This is a sick post. that’s awesome, i am definitely gonna buy the belt knife. The shark and lipstick knives are just too much! I HAVE GOT TO GET AT LEAST 1 OF THEM…THEY ARE AWESOME. Gee, doesn’t really make me feel safe when flying. I’ll take a simple ceramic knife. 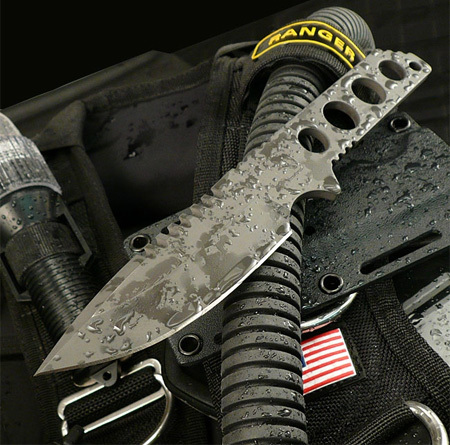 Dive Utility Knife is MEGA Badass! excellent, because what the world needs is more knives. Sir, I’m afraid you’ll have to come with us. @forumlogic, rest ye moral highness. I would rather have (and not need) a weapon for self defense than need (and not have) a weapon for self defense. Ha it’s a key and a knife a KaKnife. I find that knifes are the perfect protection device as one could have. I wish that one could carry this type of personnel protection over a gun. I only wish law and people would understand that with out knifes and swords man kind would still be throwing stones to protect themselves from crimminals and food. I wish that I could find more sites like this one. The manticunda knife is a useful tool and a badass weapon, while the scissor knife is just plain stupid. The Neolithic knife is simplicity in the making. Diving knife is completely awesome. Corrosion resistant and one solid piece of metal= no weak points. I was looking for something to get my boyfriend for Christmas and these are perfect, although my favorite can’t seem to be found! Where’s the scissor knife! The link doesn’t seem to carry it anymore, and Google’s failed me.. I like the Dive Utility Knife. A knife isn’t a weapon it’s a tool. The only weapon is the human body itself everything else is just a tool to be used, everything from pocket knives to nukes they are all just tools to be used.